Limited quantities of flavorful tomatoes are soon to be harvested. More lettuce, peppers and cucumbers will be available soon. Our cut hay was rained on for a couple days. Fortunately we had a couple of dry days with a steady wind. Once raked, the hay dried out enough to put into round bales. Homegrown and all natural is best for our herds, and for us. Michigan weather provides a great growing environment for many species of herbs. Everything from dill to sage and mint grow well here. This is great news for the adventurous cooks and exotic eaters. We recommend that you try a new herb every so often. They provide flavor and a wide variety of complex nutrients, not otherwise found in a regular diet! 1 lb Navy Beans, rinsed, sorted and soaked over night -then drained. In a large stock pot simmer lamb, seasoning mix, chopped garlic scapes, reserved kale stems and tomatoes in olive oil, just until meat is browned and tomatoes begin to lose their form. Stir in water, add beans, and chopped kale. Garnish with raw chopped onion, add salt and pepper to taste. More Help Has Arrived and thank goodness for that, I have been doing so much double duty that at the Rochester Farmers Market my tongue got twisted. It was cold and rainy and the wind chilled my hands to numbness, I was so impressed with the customers that braved the weather that I would say “Thank you for braving the weather” and ask if they wanted to try some cheese. One couple came by and I said “Thank You for coming are you brave enough to try some cheese”. I got a funny look as they walked away. Lauren Russell has arrived to rescue me she will be helping with the weblog and is going to breathe new life the listless Facebook Page. 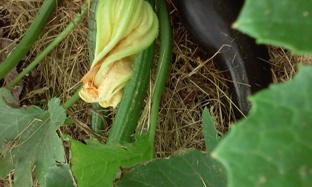 Law Family Farm and White Pine Farm have summer squash available. The purple peppers are just starting to ripen. Zuchinni and Yellow summer squash is coming into season. Lettuce is back and the shade cloth on the hoop house so it should stay fresh for a longer time. Strawberries from Bear Lake had a bad growing season so many people who ordered the berries did not get them. Almar Orchards said the trees are blossoming well so expect some great apples late summer to early winter. On the east coast garlic scapes are in demand, in our area not many of us know what to do with them. Put the scapes, cheese, pine nuts, Basil and half the olive oil in the bowl of a food processor (or use a blender or a mortar and pestle). Whir to chop and blend all the ingredients and then add the remainder of the oil. If you like the texture, stop; if you’d like it a little thinner, add some more oil. Season with salt. If you’re not going to use the pesto immediately, press a piece of plastic against the surface to keep it from oxidizing. The pesto can be stored in the refrigerator for a couple of days or packed airtight and frozen for a couple of months. 1.Preheat grill to medium high. 2. Pick through scapes and discard any that are mushy or dried out. Cut off tough ends (as you would with asparagus). Rinse and dry. 3. Drizzle with olive oil and toss to coat. Sprinkle with salt. 4. Place scapes on grill and spread out evenly (be careful they don’t fall through!). Close lid and cook for about 3-4 minutes, until they are slightly charred underneath. Flip scapes and continue cooking on the other side until evenly cooked – they should be slightly crunchy still, but not raw! 5. Remove from grill, season to taste (lemon juice is yummy too) and serve. Optional: Make a dressing out of olive oil, fresh lemon juice, maple syrup and a pinch of sea salt, whisk together. Toss large leaves of radicchio, or other bitter lettuce with dressing, and place grilled scapes on top. Saute the garlic scapes and onion in olive oil over medium heat until soft. Add the thyme at the end. In food processor puree the vegetables and add chicken stock as needed to make a smooth paste. In saucepan heat the vegetable mixture and add remaining chicken broth. Bring to a simmer and add the cream. 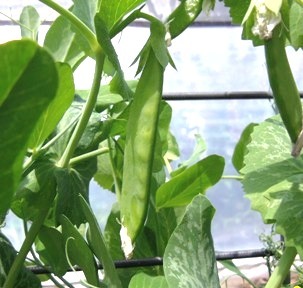 Peas are starting to be harvested, the asparagus is done for the year and more lettuce will be available soon. Even though we had a very dry spring the rains are making up for it. The sweet potatoes are planted at White Pine Farm. The sweet potatoes slips have arrived and we will be planting them Saturday, if any one wants to experience planting sweet potatoes and come visit White Pine Farm on Saturday you can call us at 810-688-3192 to let make arrangements. The cucumbers are growing nicely in the hoophouse, this variety of cucumbers has tender seeds and a wonderful flavor. Outside the cabbage is planted in paper, the paper is approved for organic use and degrades over time back into the soil. The paper controls the weeds so we can focus our time on weeding onions and carrots. White Pine Farm Cows (taken May 28)the pile in front of the fence is garden compost. 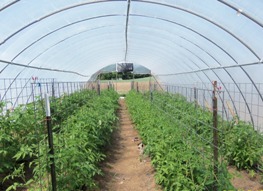 The tomato plants have been growing nicely this year in the hoop house. The ants think of kale as their own personnel playground or they are hunting for aphids to milk, they will protect the aphids from any aphid natural predator as the aphids provide the ants with a food source. Dale set ant many traps out, hopefully between that and the Diatomaceous Earth we will get them under control, that should give the natural predators a chance to control the aphids. The cattle are happy feeding in the lush pasture; they were actually frolicking and running to the fence because sometimes they get garden scraps. Next fall expect to see some of White Pine Farm beef for sale on the website. BUSY BUSY BUSY All the farmers are hustling to get their gardens and fields planting. Dale has been putting the paper mulch down and planting in them. He is also out seeding some of the fields that the cattle pasture on. With the big temperature swings it is a constant opening and closing the hoop-houses from either frost or too much heat. The potatoes are still sitting in crates waiting to be cut for potato seed. The sweet potato slips will be arriving a little later than normal. The cattle are out of the small front pasture and into the larger pastures. Sweet corn has been planted, the peas outside are needing to be trellised, the bee hives are doing fine. The two evils attacking the plants in the hoop-houses are grasshoppers and aphids. There are some natural methods to help control them, which we are doing. RAINS CAME we are so grateful that we are getting our April showers—-oops—we did not get any showers in April, I guess we will call these May Showers. The trees are blossoming and the asparagus is growing. I don’t seem to have time to take pictures of what is growing; if I do I will add them. The hoop-houses are the insides are looking good. The tomatoes are being trellised and since we had a frost last night, everything was covered and everything survived the frost. I ate for the first time a salad turnip on my salad and it was yummy. I hope others like them as well. If they do than we will keep growing them. Me, My Health and Eyes. Patricia Aldrich will be relocating to Florida within the next 2 Months. Her business practice will continue on every aspect by means of Skype, email, mail and phone. She will also have a by weekly newsletter Via email and a website is under construction. She will have 2 visits per year to Michigan to do in person consults. Because of her relocation, the CSA is in need of a new delivery/pick up location in the Lake Orion area. If you know of a chiropractor, Natural Practitioner, Storefront that would be willing, please contact the CSA, Thank You. The New Kitchen MDA has looked at our new Kitchen, it is close to being ready. In order for the market to operate and for the farmers to process some of their own products we have to have both a licensed kitchen and a licensed warehouse. MDA couldn’t decide how to categorize since we are online so those are the requirements they came up with for us to operate. This coming Tuesday after the new hot water heater is installed we will be licensed, the old hot water heater was too small to meet their requirements. We have been grateful to have been able to use the a mobile kitchen from MOFFA (Michigan Organic Farm & Food Alliance) for the last few years. They are a great organization and they are donating the trailer to the MSU Student Organic Farm. No sooner did Dale get the onions planted and the weather got cold and it snowed. I’m sure that the weather will take out some of the plants although we won’t be able to access the damage until it warms again. There are extra onion plants on sale on the website for those that like to garden and grow some of their own. They are Certified Organic from Deep Grass Nursery. If the weather is warm and sunny over the week end more lettuce and greens will be ready to harvest please don’t hesitate to request some if they show sold out. If the weather stays the way it is we still may have extras. It is time for me to read up on the best natural predators for the pests we have in the garden/hoop houses who are devouring the crops. Oddly CSA Farmers Market keeps me so busy I don’t have much time to help on the farm. The garlic is growing and this Friday Dale, Kristie and Stephania will be planting tomatoes inside one of the hoop houses. 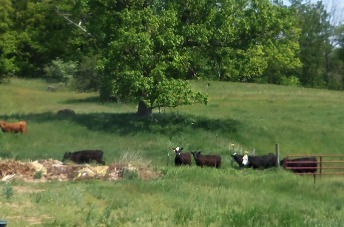 We increased the size of our beef herd, they will be on pasture all summer. Maybe this year we will be able to make our pastured beef from White Pine Farm available on the website. We are also hoping to get back to chickens, we have to complete the licensed kitchen, finish the fencing for more cattle pasture fields and other things before we can build a larger better coop.